September | 2015 | Old Bat On A Bike. On 13th September just over 500 athletes started the Challenge Weymouth long distance triathlon. The weather was not very kind and as the day wore on it got progressively windier and wetter. 408 athletes completed the triathlon inside the cut off time of 16 hours. I completed in 14 hours and 7 minutes which was about 20 minutes quicker than I had hoped for. All those months of training had paid off. I did it!!! It was a very long hard day. This entry was posted in Triathlon on September 16, 2015 by Ian. I entered the Challenge Weymouth last September but I didn’t tell very many people. There is a lot of stuff that can go wrong when you start to train an ageing body to do stuff it used to do. I started running again. I went out with Egdon Heath Harriers on Club nights and did a few low key races. I had to face the reality that I was now running at a much slower speed than I was a few years ago. I still find this difficult to accept and will keep working at it – even to hold the status quo. This entry was posted in Audax UK, Dorset, Triathlon, Walking on September 12, 2015 by Ian. The event that I have been training for all year is almost here. On Sunday 13th September I will take part in Challenge Weymouth Long Course Triathlon. This is an ironman distance triathlon comprising a 3.8 kilometre sea swim in Weymouth Bay followed by a 180km bike ride (with 1880m of elevation – hills that is!) and then a full 42.2 km marathon run. The clock doesn’t stop during all of this, so quick changing between each element is necessary. Food and drink is taken on the move. The whole event must be completed inside 16 hours with the swim taking less than 2:15 hours and the swim and bike 10:30 hours. I am the oldest woman on the start list. In Triathlon your age is taken as of 31st December so as I am 60 in November I am in the 60 – 64 category. There are no other women in the category and there is just one woman in the 55-59 category. Throughout the year I have taken part in several running races and one standard triathlon. I have kept up my Audax AAARTY with a hilly ride each month. 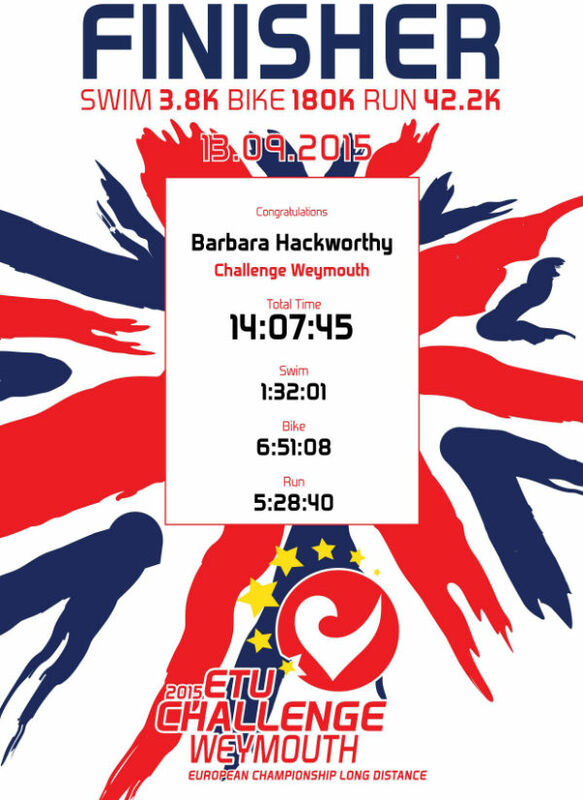 This entry was posted in Audax UK, Dorset, Triathlon on September 9, 2015 by Ian.